Peugeot and Pininfarina have been working together since 1951 when Peugeot decided to call in an independent design house to create its new 403 Saloon. Peugeot was seeking a distinctive, lasting look of its own and it was no accident that it opted for Pininfarina, a design house with an established international reputation for a style that combined classicism, inventiveness and personality. Initially confined to design, it was in the Sixties that the relationship was extended to manufacturing and Pininfarina produced its first complete cars for the French company. They were niche cars, coupes and cabriolets. Pininfarina produced the bodies which were then sent to Peugeot where the mechanical parts were assembled. A series of numbers and successes followed: the 404, the 204, the 504, the 205, the 306 and finally we reach, what must surely be the most handsome of the bunch the 406 Coupe. The 406 Coupe project added a new dimension to the Peugeot Pininfarina partnership, because, for the first time Peugeot entrusted Pininfarina with the responsibility not only for the exterior and interior styling, but also for manufacture, production and testing of the complete vehicle at Pininfarina's own manufacturing plant. Some would say that the effect of this increased responsibility was to stimulate the already fertile inventiveness of the Pininfarina designers to create a car which was at the time (and remarkably still is) capable of arousing emotions that can only be the fruit of artistic expression. In the closing years of the millennium it was easy for designers to fall prey to insipid, immobile "retro" tendencies, so the brief given to them by Peugeot required a vehicle that was serious and formal rather than ephemeral, but was also of a very high quality and with a timeless beauty, that would not decay rapidly. Pininfarina's research studio started the styling phase in June 1992 with a number of renderings of cars that differed in their general set-up and the shape of their sides. The first two full sized models were produced very rapidly (September 1992) for an initial verification: one already hinted at the final result, the other proposed tauter lines. A while later two painted, more evolved plastic models were built, and one of these was extremely close to the final result. It already gave a glimpse of what the sides, the volumes and the recessed rear wlndow would look like. A final mock-up appeared in April 1993, which was almost identical to the final reference model of January 1995. 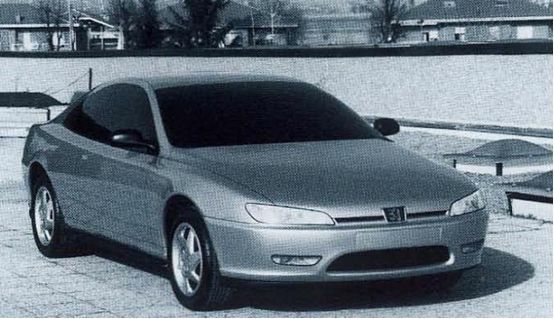 The importance that Peugeot attributed to its return to a coupe was underlined by the fact that the new 406 Coupe, although originating from the 406 family was conceived and designed as a completely new car. In fact the 406 Coupe and the 406 Saloon shared only the floor pan, the range-topping engine of the time, and a few interior components, though modified and personalised. This meant that as the Coupe shared no body part with the 406 Saloon it required specific investments in design, testing and manufacture. Pininfarina's global responsibility for the subsequent construction of the vehicle and the intrinsic difficulties of an extremely ambitious styling, technical and qualitative project, required an extra effort in the search for technical and manufacturing solutions due to the complexity of the strong and distinctive styling elements, typical of a top of the range model. 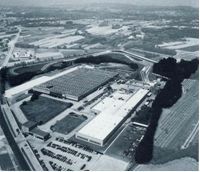 From 1993 the development phase of the Coupe brought Pininfarina and Peugeot into close cooperation: a specific project team, representing all the Company functions involved in the development of the new product (design, testing methods, quality control, logistics, purchasing costs, marketing. etc.) was set up at Pininfarina. 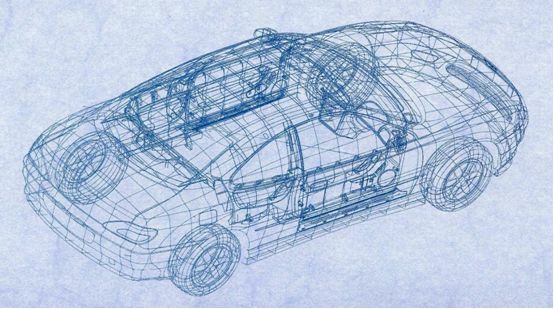 During construction and testing of the prototypes and throughout the manufacturing phase, numerous problems posed by the complex shape and content of the car, were tackled and solved, sometimes with results that exceeded objectives. 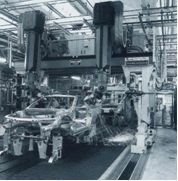 Some of the issues that had to be dealt with included: the particular shape of the large doors without upper frames, the shape, recess and silkscreening of the rear window, the large front bonnet and its opening mechanism, the polycarbonate bumpers that withstand deformation and small bumps, the special movement of the windows which descend automatically when the doors are opened for functional reasons , and are locked to safeguard passengers In a dangerous situation, the rear quarterlights, the complex surface of the rear boot cover, the hinge system of the rational "parallelogram" opening mechanism on the luggage compartment, and the shape, depth and transparency of the elliptical head lamps. The car's aero-acoustic comfort level were also particularly high thanks to accurate research sessions in the Pininfarina Wind Tunnel, directed both at reducing external sources of noise and the optimal design of the sealing system thus minimising acoustic infiltrations. For the interior too the design set out to achieve the highest possible quality and comfort in order to meet the expectations of Coupe owners, with four proper seats that were comfortable and welcoming, and also provided a very generous luggage compartment. Even with the attention to detail in all these areas, it was without doubt the bodyshell shape taken as a whole that was and still is the strong distinguishing feature of this car. The fact that it also combines excellent performance and roadholding with high levels of safety is just a bonus. 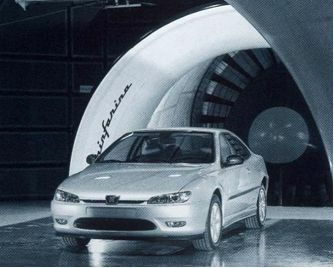 The manufacturing process of the new Peugeot 406 Coupe included assembly, body-in-whlte finishing and painting processes were performed in the Grugliasco plants; followed by trimming and assembly of the mechanical parts with subsequent testing of 100% of production on Pininfarina's own test track (and on the road) at its San Giorgio Canavese plant. Having originally entered production with two engine options, a 3.0 L (194 bhp) and a 2.0 L (135 bhp,) both of these were later replaced with newer more powerful engines of the same capacity. The new 3.0 L engine developed 210 bhp, and the new 2.0 L engine had a modest increase to 137 bhp. In addition to the 3.0 L and the 2.0 L options, a further two were added to the range around 2001. The first was a 2.2 L (160 bhp) petrol engine, and the second, and somewhat of a surprise at the time, was a 2.2 L (136 bhp) HDi engine. Whilst the stunningly beautiful external shape remained the same some interior facelifts were also carried out, although not all revamped models were made available in all parts of the world. By the end of the 406 Coupe's production, records indicate that a total of 107,633 were produced at Pininfarina of which 10,709 were imported into UK market.